Natural Resources diamonds, gold, silver, tin, bauxite. 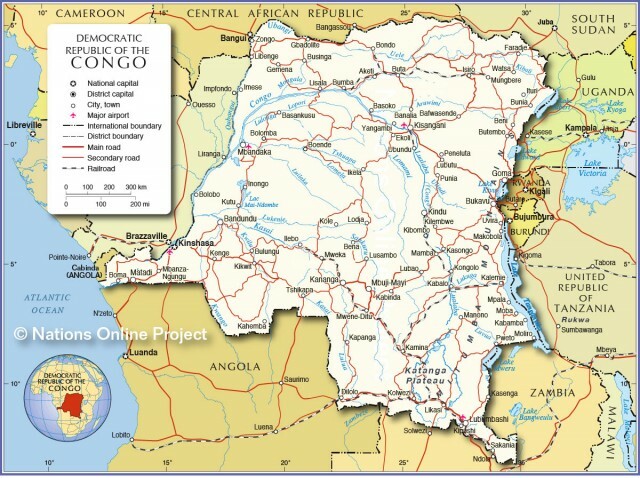 THE DEMOCRATIC Republic of Congo (DRC) is strategically located as the geographic centerpiece of Africa. Smaller in area than only SUDAN and ALGERIA, the DRC is the third-largest country on the African continent and is slightly less than one-fourth the size of the UNITED STATES. Though possessing tremendous mineral resources, as well as the largest forest reserves and the largest hydroelectric potential in Africa, the DRC remains mired in economic distress owing to a history of exploitation. This exploitation began in 1885 when King Leopold of BELGIUM gained control of the area then known as the Congo Free State and treated the land and its people as his own personal fiefdom. In 1908, it became a colony of Belgium and remained under Belgian control until gaining independence in 1960. Independence, however, did not bring an end to the troubles facing the DRC. Woefully unprepared for selfdetermination, the country quickly came under the dictatorial rule of Mobutu Sese-Seko. For the next 35 years, the DRC remained under Mobutu’s corrupt and brutal control until a military occupation of Kinshasha ended his one-party rule in 1997. Yet the rewards of deposing Mobutu remained indeterminate, as the country has since been wracked with ethnic strife and civil war involving both internal and external forces. It is this continuing legacy of instability that has mired the Democratic Republic of Congo in a state of poverty. Despite being one of the poorest countries of Africa, the DRC could be one of the continent’s richest. The CONGO RIVER basin and its vast resources dominate the country’s landscape. Emanating from Lake Mweru in the far southeast, the Congo River crosses the equator twice before reaching the ATLANTIC OCEAN some 2,880 mi (4,630 km) later. Carrying the second largest volume of water in the world, the river could provide substantial hydroelectric power. Heavy annual rainfall averaging along the equator contributes to the river’s flow, as well as to the equatorial rainforest covering more than 50 percent of the country. The forest contains a tremendous variety of flora and fauna, including such rare animals as the gorilla. Further south of the equator, as well as to the highlands of the east, the rainforest gives way to savanna GRASSLANDS where lions, antelope, and giraffes can be found. The size of the DRC, which offers such resource potential, also serves as a liability. With a predominantly rural population composed of over 200 major ethnic groups speaking more than 700 different languages and dialects, the Democratic Republic of Congo must improve its transportation and communication network. The country’s population is clustered between the forest and highlands of the east, and in the strip of land stretching west from to the 25 mi (40 km) strip of coastline along the Atlantic Ocean through the capital of Kinshasha and into East Kasai. Most of the people are involved in subsistence agriculture and other primary activities, including mining. Cash crops, including coffee, cocoa, and palm oil, are also important, though difficult to export due to the country’s woefully inadequate infrastructure. With a declining economy, a history of conflict and corruption, and billions of dollars in external debt, the Democratic Republic of Congo will remain faced with hardship into the foreseeable future.